Professional Multi-Format LCD & OLED Monitors for critical broadcast, post production, and multimedia monitoring. 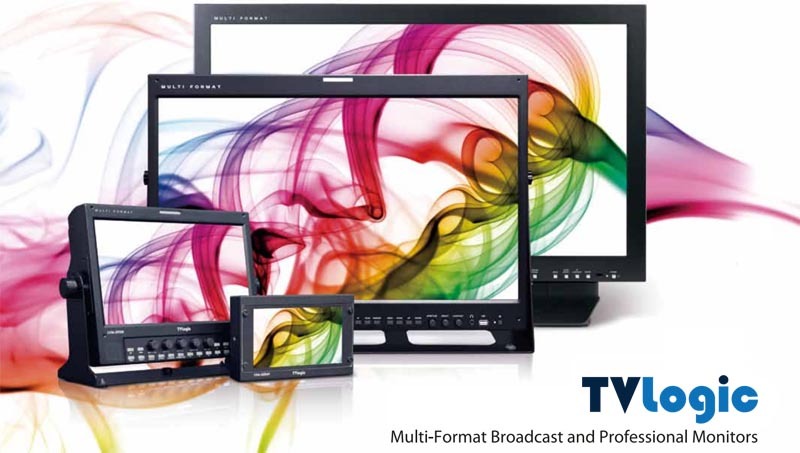 TVLogic’s Professional Multi-Format LCD Monitors are the ideal solution for critical broadcast, post production, and multimedia monitoring needs. TVLogic is among the world’s leading broadcast and professional monitor manufacturers and offers the widest range of video monitoring solutions in the industry. Their precision-engineered technology and innovative designs provide customers in top broadcast and production facilities around the world with reliable reference grade displays for the most demanding critical viewing applications. Multiple input signals and formats supported on each monitor – SDI, HDMI, Composite, Component etc. Light weight, compact and rugged design reduces the cost of shipping and transportation making it the ideal choice for small studios and OB Vans, wherever space is a premium. Does not require expensive input modules. DVI, SDI, HD-SDI and analogue input modules are all standard. Some models also include Dual Link and 3G support. The LVM automatic setup and internal picture adjustment deliver optimum results from any source material. From the 7” to the 55” wide screen LCD solution, there is a model in the LVM range to suit every application. Every LCD monitor offers 4:3 and 16:9 aspect display making the LVM series ideal for Studio, OB Van, non-linear, film/ video-assist, digital signage and film production. With support for SD, HD and 3G standards and featuring many built in extras like Waveform monitor, vector scope and focus assist the LVM range is ready to go out of the box. All monitors above 17″ are Full HD resolution with the smaller screens offering scaled and one-to-one pixel viewing. The LQM range builds on the LVM’s by adding Quad-split allowing four inputs to be viewed simultaneously in a variety of layouts. The VFM Viewfinder range is proving to be one of their most popular.Their latest offering is also their smallest – the VFM-058W is a 5.5″ Viewfinder monitor designed specifically to sit with modern film and television cameras. Despite its small size the screen has a Full HD resolution of 1920 x 1080 making for an incredibly sharp and vivid image. TVLogic also have a true Grade 1 range of displays equipped with both a native 10bit LCD panel and high quality RGB matrix LED backlight. The XVM range has been built specifically for high-end colour critical applications while retaining many of the great features found in the popular LVM series of displays. In Europe these monitors comes with 3G and Dual Link as standard. The XVM-245W features an integrated 3D LUT providing accurate reproduction of various colour spaces and can be calibrated using third party tools such as those from Light Illusion. With 17″, 24″ and 32″ screens in the range TVLogic’s colour accurate displays are available for on-set through to edit suite. The last in the TVlogic line up is the most cutting-edge – the LUM 4k displays. The massive LUM-550W a 55″ native QFHD resolution screen which can display four Full HD inputs at once at full resolution. Used for ultra high-end imaging this screen provides the ultimate image quality for the moving image. It stands apart from other 4k screens in its support of SDI, HDMI and DVI inputs as standard, with support for broadcast frequencies to support everything from 24p, 30p, 50p and 60p signals. The latest addition to the LUM line is the LUM-300W, a 30″ true 4k display (4096×2048) that is DCI compliant making it the perfect screen for film work. Wide Range of Inputs as Standard – TVLogic monitors all come standard with 2 x SD/HD auto-sensing/ auto-switching SDI, Component, Composite, S-Video, RGB, & DVI-I (or VGA) inputs. True Multi-Format Support – Support of NTSC, PAL, SECAM & virtually all SD/HD digital formats is standard. This includes support of PsF formats as a standard feature and support of 1080p60 and 4:4:4 sources over the password enabled Dual-Link option. Slim & Smart Design – Single Piece design means there are no external I/O boxes, cables, or bandwidth limitations to worry about. The slim design, low power consumption, and easy to use rack mount kits for every monitor from the 7” to the 24” units allow them to be used in virtually any situation from an OB Van to Master Control and everything in between. Industry Leading Video Processing – TVLogic uses industry leading video processing & de-interlacing chips combined with their own unique Digital Signal Processing Algorithms to provide unparalleled video quality and accurate picture reproduction from all sources. – 7” & 9” monitors are Rack Mountable in both single and double (side-by-side) configurations. – 17.1” units are easily rack mounted inside a rack with simple rack ears available as an option. – 24” units come standard with both a desktop stand and Rack Mount Kit. Half of the unit mounts inside the rack to hide all connections leaving a clean looking bezel (sticking out approx. 2”) outside the rack that is only 21.7” and wide. These units can be placed side by side in most standard racks (typically measuring 22” or more outside to outside). TVLogic monitors are also equipped with VESA mounting holes for added flexibility with respect to mounting options. Optional Glass Neutral Density Filter – Some monitors in the LVM range can be outfitted with an optional Glass Neutral Density Filter. This option serves to enhance contrast, improve black levels, and give the monitor the familiar glass look of a CRT monitor. This option is ideal for environments like edit suites or for critical evaluation monitors in QC environments. We make this feature optional because it is not ideal for all scenarios, specifically in high-brightness environments where the matte finish panel without the glass would produce significantly less glare. The basic premise behind the ND filter is its characteristic of filtering the light emitted from the display once while filtering ambient light reflected from the display twice. This aids in producing much blacker blacks and also in enhancing overall contrast ratio. Call us on 01462 433558 for help choosing the right TVLogic monitor for your application.